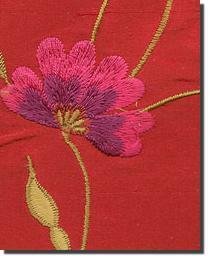 Chinese history credits the invention of silk fabric to Yuen Fei, the concubine of an Emperor who ruled in 2,600 B.C. Legend has it she dropped a cocoon into hot tea and it unraveled. She, by reason of the discovery, has been deified and is worshipped as the goddess of silk worms. Tusah silk is produced by silkworms that feed on oak leaves. Silk dupioni is produced from 2 silkworms that spin a cocoon together, thus making a strong double-thread silk. 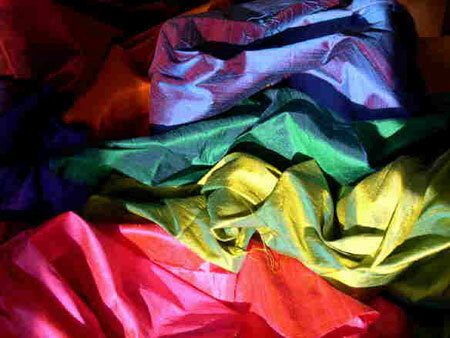 Dupioni silk is currently enjoying great popularity. The finest quality silk is made by mulberry silk moth, Bombyx mori, which, of course, feeds on mulberry leaves. The average cocoon contains 300-400 meters of silk. It takes about 5500 silkworms to produce 1 kg (2.2lb) of raw silk! One ounce of eggs produces about 20,000 worms, which consume a ton of mulberry leaves during their lifetime. Silk has been unearthed in the Qianshanyang Village of Huzhou in Zhejiang (China) and has been estimated to have been produced 4700 years ago! The term SHANTUNG (A heavy wild-silk fabric with a rough surface) comes from the region of Shantung in China. The term ORGANDY (crisp cotton or silk fabric) comes from the town named Urgench (in present-day Uzbekistan in Central Asia). It was on the old silk route and was an early market for Chinese silk fabric. Countries all over the world celebrate silk by issuing stamps in honor of sericulture (silk production). Early aircraft design utilizing silk stretched over a lightweight skeleton. Strength, durability and weight were critical characteristics that made silk the best choice. In the next few years, we might be filling our closets with smart shirts that can read our heart rate and breathing, and musical jackets with built in all-fabric keypads. The electronics and computer industries are developing wearable devices and computerized apparel, so that they are virtually invisible. As with all clothes, computerized apparel starts with the proper thread. 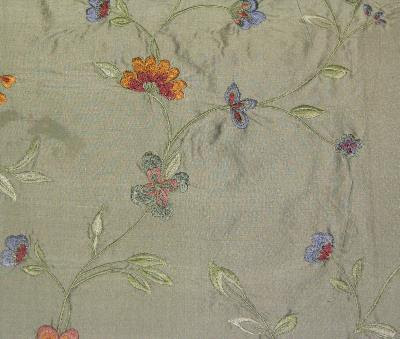 Silk fabric is ideal for computerized clothing because it is made with fibers that make it conducive to electricity. 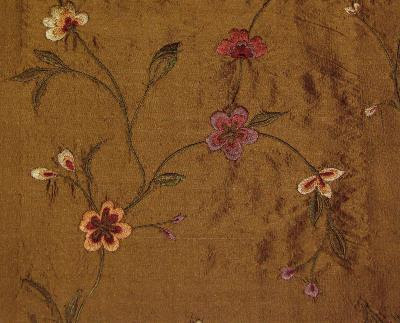 The first fiber is just an ordinary silk thread, but running in the opposite direction of the fiber is silk thread that is wrapped in a thin copper foil. It's this copper foil that gives silk fabric the ability to conduct electricity. Not only is this type of silk fabric a good electrical conductor, it's fiber's are spaced with the right amount of space, so that the fibers can be individually addressed.